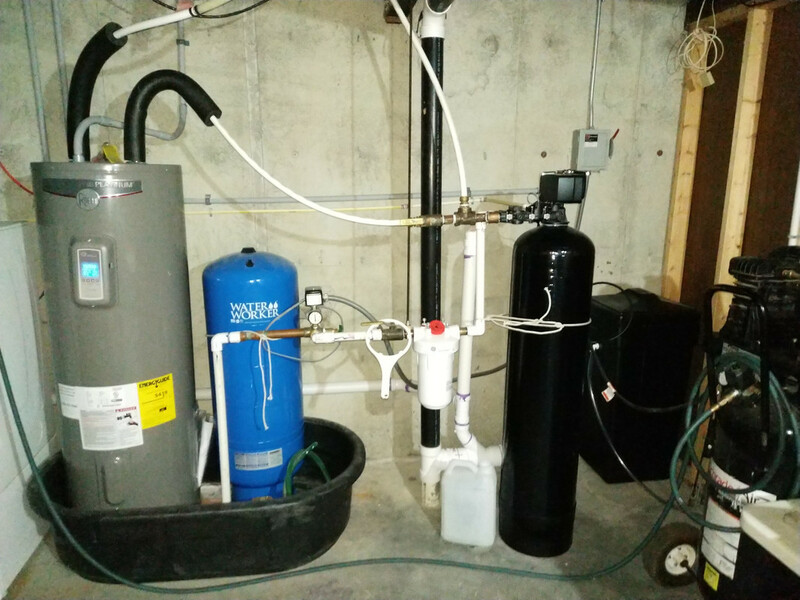 In process of replacing my water softener I did some looking into home and pool use. Terms are shortened or simplified. A water softener is similar to a sand filter in water flow but has resin in it that has salt attached to it. When water with calcium passes through it the resin lets go of the salt and grabs the calcium, after a period of time or gallons flowed through it the system back washes and the resin that has calcium attached lets go of the calcium and grab onto the salt. Water is a solvent and grabs calcium and such as it washes over surfaces, this is why hard water does not clean well as it is already loaded up and soft water washes soap off easy. A water softener can treat one grain (Grain/gallon or 17.1 ppm CH) of hardness per grain of rated capacity. For example, my water is 250 ppm or 14.6 gr/gal rounded up to 15 gr/gal, my 64,000 grain softener will able to treat 4266 gallons of water before a regen. My control unit is set for 300 gallon reserve capacity so it recharges at 3966. The price of the softened water is 8 ppm salt added per gr/gal, 8 x 15 = 120 ppm salt added to the water, with us being knowledgeable pool people we know this to be a non issue unless your drinking this water with a low sodium diet, in case you can use potassium salt. Well my 24' x 52" pool is 12,400 gallons so it would take a long time of filling and doing on demand regens, waiting, and then repeat till full, and then having foaming issues when full due to 0 CH, this is not practical. Setting the softener on bypass and filling the pool to 250 CH and then doing all top ups to the water with soft water will maintain 250 CH forever, with only rains washing over surfaces picking up calcium and running into your pool as a source of CH (thanks Dirk). My softener is a Fleck 5600SXT control head with a 64,000 grain tank, cost me $640 off amazon and not much to install as i been doing mechanical room renovations. That cost compared to the labor of draining a pool or messing up your chemistry and ruining your pool along with the side effect of house faucets and equipment actually working really make this a no brainier. I took the typical TFP approach and went with 'biggest you can get' or 'double size'. The bigger size was 96,000 grains and running in the $900 so it was 64,000 for me. If your into sizing, look into yearly evaporation, gallons per inch in your pool, and figured capacity in gallons, or just get a 64,000 grain. I have an idea that one can purchase a rv softener and a gallon meter and hook it up to the pool and flow the softener to capacity and then manually regening the unit, if anybody does this please report back your results, seems too labor intensive but doable. My last softener would reduce the CH from 250 to 220, my dishes were not clean, dishwasher was getting broke, my faucets were plugging up, shower heads getting ruined, cat bowls would need to be tossed out, and my daughters eczema was getting worse. This is the best purchase I have made in my life. I would like to make a technical clarification to your post - the exchange occurs between sodium ions (Na+) and calcium ions (Ca2+) only. So you should really be careful with using the term “salt” as sodium chloride is simply the medium by which one obtains an excess sodium ion concentration. Any increase in water salinity (sodium chloride or potassium chloride) is due to salt residue in the resin bed itself from the regeneration process. It’s an artifact of the equipment, not an intentional addition. My softener is 54k grains as I opted for the dual tank eliminator system which has a granular activated carbon filter to remove chlorine, chloramines, VOCs, etc. I have a few concerns about my setup. The most obvious one is why everybody in the SW is not doing this? What's the hold up? Do we know something they don't? Or is it the other way around?!? cf claims no brainer. Seems that way to me. The other thing that is still a wild card for me is the capacity. I bought my softener well before I thought to hook it up to my pool. A few hundred bucks from Lowes. Has worked fine for my needs in the house. I don't know its size, in grains or otherwise. I don't know my evaporation rate. And I'm just now coming into summertime evaporation for the first time since the hook up. How do I determine if my softener is keeping up? I hear it regen'ing more often, but it's in the middle of the night, so I'm not always awake during the scheduled time, so I don't know if it's doing it every night. If it doesn't regen every night, is that indicative that it's of sufficient capacity? If it does regen every night, does that mean it might not be keeping up? cf is throwing around a lot of figures I don't think I have access to (certainly not knowledge about), especially reserve capacity? How does one learn this stuff? Or get info about it specific to my model? I really just need to know if my unit is supplying what my house and pool are using, or if at some point during the day I'm running hard water through everything. And finally, as I mentioned in J's thread, is it possible my test result of the softened water of CH-zero is true? cf, you mention 250 to 220, is that typical, or just a bad unit? Can one achieve 350 to 0, as my tests indicate? Update. It just started regenerating just now. As it did last night. I'm thinking it might be doing so every night. And it's only May. I need to figure out the capacity dealio. Can you guys point me in the right direction to do so? The home Depot units here are 30k grain, apples to oranges. Test your water from your tap, mine is a true zero, it was pretty awesome. Reserve capacity is when you have a metered unit, mine can go 4266 but the need to Regen will trip at 3966 so it does it at night when water is not being used. You figure it by taking 75 gallons times people in the house. Example the meter gets down to 0 at 4 pm in the day, the softener waits till 2 am and regens, you still have 300 gallons of soft water as a reserve, which seems to be plenty for my family. My old unit was from 1996, had a mechanical timer and you guessed your need and set it accordingly. I had it Regen every other day, used a bunch of salt. This unit is 3x the size but since it is metered you only use the salt you need, I don't use hardly any salt. If you run out of salt you can get only partial regens and have unsoftened water. My whole house filter is just a cartridge filter rated for around 30k gallons, then you toss it and replace the filter. Mknauss is always mentioning evap rates, I believe he is looking them up online somewhere. My Clack valve operates on a demand initiated regeneration, which is just a fancy way of saying that it measures flow rate and volume through the softener and then regenerates when you’ve reached the set point volume (max capacity - reserve capacity). I have a button I can push on my Clack valve that tells me the number of gallons left before regeneration starts. I noticed it ran yesterday when I went out in the morning so mine does not wait until the off hours (2am) to regen. I think that’s an option one can set but it’s buried in a service menu that the end-customer isn’t given access to (although I was told I could have access to the valve configuration menu if I asked. They just don’t want customers messing up the valve settings). So it looks like I’m getting about 6 days between regen cycles which is about what I expected given the large family I have. I can also manually regen the unit if I want to. My unit uses 25 gallons of water per regen cycle so even if it did 8 regens per month, that still would be just 200 gallons of water per month extra which is nothing compared to my other uses. My salt tank holds 200lbs of salt which should last several months based on regen capacity. I get 50 lbs bags delivered from the softener company at $7.50/bag. Lowes/HD/Ace are all $7.50 for a 40lbs bag. Dirk, you definitely want to get an idea of your unit’s capacity. The pool can use quite a bit of water during high evaporation periods and you want to make sure it doesn’t run your softener out before a regen cycle. There’s no damage that will occur to the softener if it gets exhausted; all that happens is your water hardness goes up. As for why softeners aren’t more prevalent - probably a lot of reasons. I have a neighbor who’s a southwest desert native and he thinks it’s “stupid” to waste money and water softening it. To him, it’s a solution to a non-problem. Part of that argument is right - there is no health benefit to softened water. So if all you have to do is keep fixtures clean or deal with calcium scale, meh!, not really a problem. Others believe that softeners use/waste a lot of water and make your water bills go higher. Old softeners with timer based valves certainly use more water than demand-initiated regen but that’s fixed by replacing old softeners. Also, there is added expense - regen water and salt. Maybe it’s not huge for some people but others might consider it an expense not worth paying for. Talking with the plumber, he mentioned that building a house and adding the softener loop to the plumbing layout typically raises the plumbing costs by about a $1k. So he was a little surprised that someone paid to have the house built with a softener loop but never used it. I would definitely say that if you are building a pool in Tucson and your house doesn’t have a softener, then it’s worth adding to the build. Calcium is just one of those insidious pool problems that builds up slowly over time. Adding even a $1000 softener is nothing compared to a pool build price tag of $50k or more and it saves the pool owner a lot of headaches. The reason I went with fleck is that they are sold online, flack are sold only in brink and motar dealer stores, the fleck is completely settable, so you can completely mess it up lol. Online said the fleck can be repaired diy but parts are more expensive. My brother built a house, a water softener was $5k! $1k for a plumbing loop is still ridiculous as water softeners have bypass valves, you can just cut the pipe, add 90's and install if necessary. What I heard last night was the filter doing it's thing at 3am. The softener is set to regen (on demand, I presume) at 4am. Which it didn't do last night. Which I hope means that at least in May, my softener is not under performing. The only thing I can't quite wrap my head around, or figure out how to determine, is if the softener skips a 4am opportunity, but the next day's evaporation calls for more than its reserve, I think I'll be getting hard water somewhere. So I think I resolve that by first determining, and then measuring, if the worst evaporation day can ever exceed my softener's reserve. And without checking, I'm guessing I'll be lucky to find the capacity in the owner manual, let alone the reserve figure. cf, how much of what I'm looking at is your high-tech softener? Is it the black cylinder and the shorter black box behind it? That wouldn't fit where I need mine to be. Is the Water Worker the filter? Or is that the white canister with the red knob? My filter is different. I don't think it has cartridges. It's self cleaning somehow, and dumps to waste like the softener does. I don't know what it's lifespan is. I have to read up on that more. In defense, my loop is 1", so it was a chunk of effort to get a 1" line there, plus the copper, sweating, bracing, etc. Not $1K worth, for sure, but not nothin'. I wonder if it was code to put it in? My house is an odd mixture of over- and under-built. Cheap windows and door knobs, but 5/8" sheetrock throughout. 1" softener loop, but hose bibs missing in back yard. Stuff like that. Maybe all code driven. Mid-six-figure home, and the guy probably saved only a couple Gs by using the shortcuts. Of course, that's 2 Gs in his pocket, so I guess he's got a boat, too. Unfortunate. Lucky for him he didn't have me around while it was being built. I'da made him crazy! Cheap windows seems to be the standard among developers. That’s how they save money as I’ve of the biggest costs to a home build are windows. I won’t even recount the nightmare we have here with the windows that the developer put in but I will suffice it to say that they are essentially falling apart and I’ll be spending a good chunk of money to replace them ... and they are barely 12 years old!! Given the sizes involved, it’s going to have to be a construction loan because the cost is going to be enormous. Yep, cylinder and short box holds the salt, the two units can be separated by up to 25' if I recall. Water worker is a pump tank, half air, half water. My well operates exactly as a air compressor does, kicks in at 40 and out at 60 psi, the bigger the pump tank, the less it kicks in. The white canster is my filter, the red is the cap for the jug on the floor, I have a slow drip that im waiting to plug. That's a stock tank I bought for $60, half the price as a water containment vessel of the same size, currently it's just a big tank, later I'm going to plum the drain (came with a bulkhead) and shut off sensors. Yes basement. That's only needed on gas water heaters, so straight pex off electric is great. Dirk also see if your softener has a meter, no meter I would upgrade if I were you, salt savings alone in one year will cover that. So far in a month I haven't used 100 lbs yet. I filled 5,000 gals in my pool with it and it's done 2 other regens since, it's a good two weeks or more without pool usage. My ch is 275 in my pool, fill is 250. If the reserve runs out I think it regens right there, so some tuning can be in order, or just up the reserve and don't care. You might take a look at JN setup, I'm guessing he has the dual tank setup that does not require a special filter as yours is. Right, gas. My bad. I know the flue is an issue, but I thought the water temp at the tank outlet was also something to be concerned about. Guess not. Coolio. That Lowes page states "Demand initiated regeneration cycle only recharges when necessary, saving salt and water." So that's good. Here's the label. Does any of this translate to capacity? Last year there was a month that I used over 1000 gallons a day average! That might have been when I filled my pool. The year before the highest daily average was 500, but I upped usage since then (more plants). Maybe split the difference and call it 775 gals per day worst month. All those numbers include the garden, and don't account for any single high day, they're average per day. So this isn't really getting me anywhere. I'm going to have to measure a hot day in summer, with irrigation off, to get me a true number of what the house and pool can use worst-case. Unless my unit is capable of 1000 gallons per day, in which case I can let this go. No help in the manual. It's a 33000 grain unit. I doubt I can "up the reserve," it's pretty basic. And I wouldn't know how to tell if it has a meter. I'm guessing no. What does "upgrade to meter" get me? Unless my unit is capable of 1000 gallons per day, in which case I can let this go. No help in the manual. It's a 33000 grain unit. You’re not irrigating with softened water, are you? I found this manual. I have the WHES33. Page 3 has some spec's. But nothing I read translates to how much water, in gallons, this thing puts out before it regenerates. Is that hidden in one of those spec's? No. I'm just using my water bill to determine total water usage in a month, which includes both hard and soft water usage, and dividing by 30 to get total usage per day. I don't have any easy way to determine just what's going through the softener, which only feeds the interior of the house and now the pool. Not from the water bill anyway. I'll have to shut off my irrigation timers, and do two water meter reads 24 hours apart to figure out what's going through the softener. I was only posting my total usage on the off chance that if my softener has the capacity to serve all my water usage, then it has more than enough capacity to serve just the soft water I'm actually using. If it doesn't, then I need to measure what soft water I'm using. What is the total hardness of your municipal water? This from the new feature (I requested) of Pool Math, and my rain water experiment phase. Can one calculate "total hardness" from this? Or do I get that from some other resource? In conversations with a neighbor, about how he sets his softener, I think we were talking 17, 18? Are those TH numbers? I have my softener cranked, so I need to figure out how better to adjust that to: (1) keep my stains away, but (2) not use more salt and regen's than I need to, especially now that I have the pool online.